Poor Mouse! A bear has decided to settle in his favourite chair, and that chair just isn’t big enough for them to share. Mouse tried all kinds of tactics to move Bear, from glaring at him and scaring him, to luring him with a pear, but nothing works. Eventually, Mouse gives up. Once Mouse has gone, Bear gets up from the chair and walks home. But what’s that? Is that a Mouse in Bear’s house?! With echoes of Dr Seuss, this joyously illustrated picture book by a multi-award-winning talent is perfect for sharing. My favourite type of picture books, are those with stories told in rhyme, and this one is a stand out. 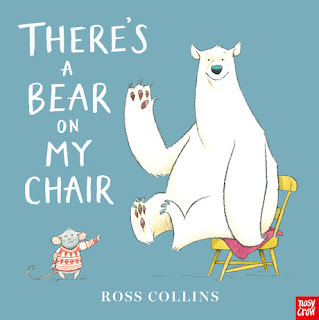 The cover of this book sets the scene beautifully…there is the title There’s a Bear on My Chair… and an angry looking mouse, pointing to the very happy bear sitting in a chair, leaving no question as to whose chair that might be! The book is full of lovely language and glorious rhyme, and the way illustrations depict the increasingly frustrated and angry mouse are comic gold, especially as nothing seems to affect the bears calm and happy demeanour. More reasons to like this book…end papers, different front and back (I love endpapers that start the story!) and an ending with a satisfactory twist.